​With the encouragement of Russian composer Nikolai Rimsky-Korsakov, a group of young Jewish musicians at the Saint Petersburg Conservatory were inspired to organize the Society for Jewish Folk Music in 1908. Its main purpose was to create a modern national style of Jewish concert music. This growing interest in Jewish nationalism and Yiddish folk culture resulted in the study of Jewish folk music from the Pale of Settlement through fieldwork, public lectures, publications, and concerts, and eventually the branches of the Society were founded in other parts of Russia. Among the Society's prominent members were Lazare Saminsky, Aleksandr Krein, Solomon Rosowsky, Mikhail Gnesin, Moyshe (Mikhail) Milner, Joel (Yo'el) Engel, and Joseph Achron. But by the mid-1920s and early 1930s, politics and economic realities, as well as World War I and the Revolution in Russia, caused many of them to immigrate to Europe, Palestine, and the United States. This concert highlights their wonderful music and follows their journey. 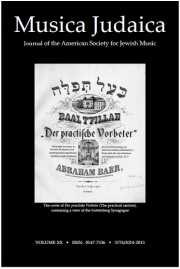 The new issue of Musica Judaica (Volume 20 is now available. Your membership dues are an essential part of the funding that allows the American Society for Jewish Music to continue to operate. Membership dues support the annual Chanukah Concert and our contemporary concert Music in Our Time, among others during the season. The sessions of the Jewish Music Forum, both at home and "On the Road" are also supported by dues from members. And, importantly, the information and access we provide without charge to the St. Petersburg Score Collection, the Charlie Bernhaut Collection of Jewish and Cantorial Recordings, as well as a host of other activities and services which help keep Jewish music alive. 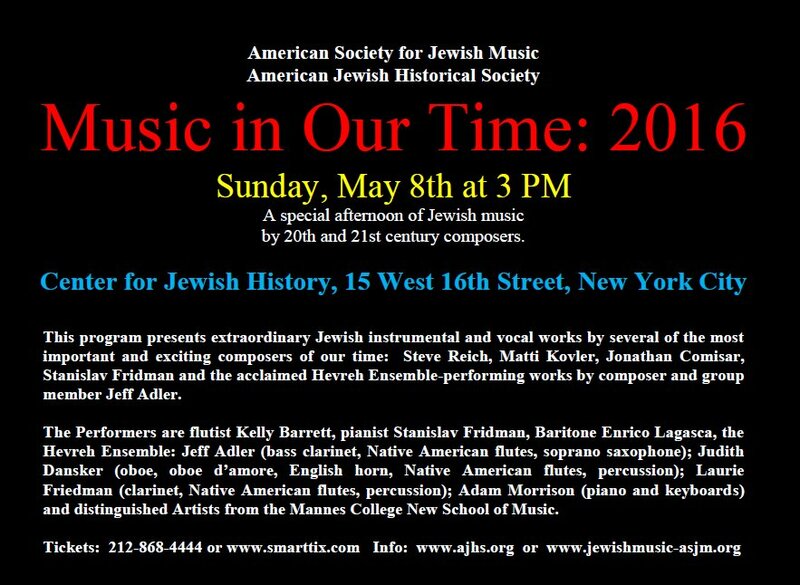 You can join the American Society for Jewish Music or to renew your membership online, or download the membership form and mail it in.